Many of us associate the beautiful Poinsettia plant with the holiday season. The plant has an interesting history and uses. The Poinsettia plant is native to Central America and flowers during the winter in an area of southern Mexico. The ancient Aztecs called them 'cuetlaxochitl' and had several uses for them. They used the flowers (which are actually special types of leaves called bracts) to make a purple dye for clothes and cosmetics. They also used the white latex sap from the plant as a medicine to treat fevers. We know about poinsettias today largely due to the first ambassador from the U.S. to Mexico. In 1825 Joel Roberts Poinsett (that's why we call them Poinsettias) brought some plants back to his greenhouses in South Carolina. He began growing them and sending them to friends and botanists. These friends shared and sold the plant and their popularity grew quickly. Their cheerful and festive colours bring us joy during the winter months and the holiday season. 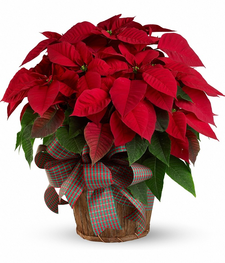 Bloomex provides amazing prices on beautiful Poinsettia plants this season, with four arrangements to choose from. Order now to brighten your holiday table or to send some cheer. These long-lasting hearty plants make an excellent gift! Send this gorgeous, explosion of popular red poinsettia plants for Christmas. Long-lasting, hardy and festive. Elegant assortment of red poinsettia plants accented with Christmas decorations and greens is arranged in 6" bamboo basket. Measures approximately 10"Hx9"W.
This growing and long lasting gift is an ideal way to say Merry Christmas! 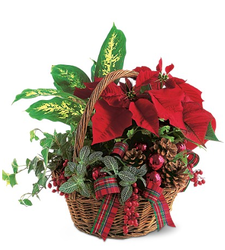 This 10" planter basket contains two assorted poinsettia blooming plants, four assorted green tropical plants, corns and decorative ribbons. 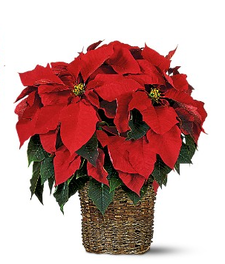 Send this gorgeous, explosion of popular red poinsettia plants for Christmas. Long-lasting, hardy and festive. Deluxe assortment of red poinsettia plants accented with Christmas decorations and greens is arranged in 8" bamboo basket. Measures approximately 12"H x 12"W.
Supreme assortment of red poinsettia plants accented with Christmas decorations and greens is arranged in 10" bamboo basket. 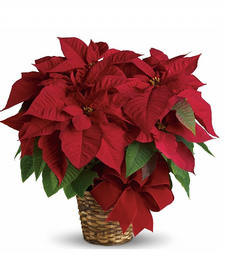 Measures approximately 14"H x 12"W.
Enjoy your beautiful Bloomex Poinsettias and have a wonderful holiday!